Many health centers struggle with no-shows and last-minute cancellations, which leave patient appointment slots unfilled. In our 2017 cycle of Catalyst, Open Door Community Health Centers began piloting a solution for filling these unanticipated vacancies. At Open Door, staff noted that patients requesting same-day appointments are consistently being turned away. At the same time, the vacant appointment slots created by no-shows and late cancellations aren’t getting booked. These inefficiencies are felt deeply by patients, staff, clinics, and the community. When appointments go unfilled, providers with blank schedules miss out on productivity incentives and clinics fail to capture potential visit revenue. Unable to access acute care services with their primary care provider, patients often don’t seek out alternative care at all, worsening their health. And the community as a whole bears the brunt of the high-costs associated with the subsequent rise in emergency room care. To address these issues, a team at Open Door is testing a same-day appointment waitlist. Open Door Community Health Centers is a Federally Qualified Health Center serving Humboldt and the surrounding counties in California. Its mission is to provide quality medical, dental and mental health care to all regardless of financial, geographic, or social barriers. Issue Patient requests for same-day care are often denied because of lack of available appointments. Meanwhile, there’s no system to fill vacancies left by no-shows and late cancellations. These inefficiencies result in decreased revenues, artificially limited access, and overall increased cost to the healthcare delivery system. Solution Tested A daily waitlist for patients in need of same-day acute care services. Stage The solution has been piloted with several provider schedules. Patients with acute care needs are being turned away because of full clinic schedules. When patients aren’t able to get same-day appointments, they go to the ER or often don’t seek out care at all, turning small health issues into larger problems. Patient no-shows and late cancellations do open up unexpected appointment slots, but there hasn’t been a way to fill these last-minute vacancies. Open Door developed a same-day appointment waitlist for unanticipated vacancies in the clinic’s schedule. In this pilot, Open Door focused on patients with acute care needs. When a patient requests a same-day appointment, staff will first assess the health need. Then, if appropriate, a triage RN will ask if the patient would like to be added to the same-day appointment waitlist. If the patient responds “yes,” they will be informed that they’ll get a phone call if an appointment becomes available. Open Door cautions patients that there is no guarantee an appointment will become available that same day. But if there is an opening, RNs will work their way down the waitlist to try to schedule patients into that slot. For the actual waitlist, it’s easier to get started using a paper log. Waiting for integration into electronic health record workflows is time consuming and can delay the pilot. Robust communication between front desk staff and the RN triage staff is critical. Continue refining processes at the pilot site and work on sustainability. Begin spread by meeting with key stakeholders at other health center locations. Prototype alternative forms of the waitlist tool, including possible integration with the electronic health record system. Work with additional team members to optimize accurate and sustainable data collection. Open Door Community Health Centers developed a waitlist log template to track patients with acute care needs seeking same-day appointments. Open Door Community Health Centers developed a call script for staff to use when communicating with patients seeking a same-day appointment. Open Door Community Health Centers' workflow guide is used by front desk staff to assess patient needs and whether they are medically acute in nature. 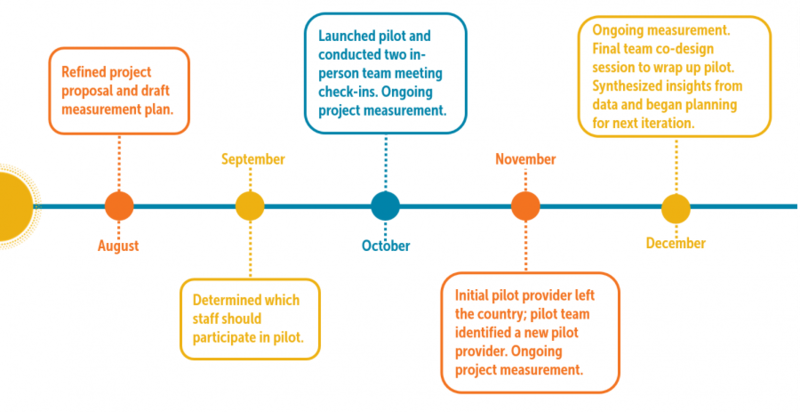 Interested in learning more about this project or how to test an appointment waitlist in your organization? Contact Sarah Kerr, Northern Region Administrator at Open Door Community Health Centers.